containing several new and interesting gadgets. Inside was a troika of toys, each promising better performance from my beloved black-pie playback system. The box included the KAB USA Record Grip, Great Sound Escorts Stereo Canceler and SpeedStrobe. Yum, yum, lets get to it! The KAB USA Record Grip is a clever little molded-rubber record clamp with the promise of an added bonus -- it has a bubble level embedded in its top. This unassuming chunk of natural rubber is just 1 1/8" tall and has a 2 1/2" bottom circumference; it costs a mere $29.95. With a round bubble level in the top and a spindle hole in the bottom, it is so easy to use its pathetic. No reflex action to clamp and no threaded spindle to screw. Once youve placed your record on the table, just push the little three-ounce plug of rubber down over the spindle until it stops and, voilá, youre ready to rock or jazz or blues or whatever -- you get the picture. The fact that it weighs in at a mere three ounces is good, as too much added mass can prove damaging to certain bearing sets. You merely let friction do the job. The Record Grip is elegant in its simplicity, but how effective would it be? Even though resonance can never be completely eliminated from record playback, using a clamp to couple the record more solidly to the platter will help to minimize micro resonance throughout that chain. Both your stylus and your disc vibrate; and each one marches to a different drummer, so to speak. This additional sonority affects the cantilever, cartridge body, and tonearm, and the record and is inadvertently interpreted by the stylus as part of the audio signal it is trying to reconstruct. It doesnt take a rocket scientist to see that controlling this additional unsolicited vibration will lead to a more accurate and detailed recreation of the original information contained within the groove walls. Besides offering resonance control, the KAB Grip has the purported added benefit of a built-in level. While I prefer the use of twin precision levels, one each for front-to-back and left-to-right correlation, this single-mounted bubble would seem to be better than having no truing reference at all. You would be surprised how easily your table can shift from true, and even more surprised at what a detriment that can become to the correct and safe tracking of your precious records. KAB reports that the Grip's level has a sensitivity of 0.1" = 45 minutes, making it accurate to within 3/4 of a degree. Replacing my J. A. Michell reflex clamp with the KAB rubber nub was a snap, but right from the outset, my fears about the inaccuracy of the single bubble level were manifest. Once the turntable was leveled, I removed the KAB Grip and reinstalled it, one-quarter turn away from the original orientation. The clamp now mistakenly indicated that the table was again out of true. Re-leveling at this new position, then rotating the clamp yet another quarter turn yielded the same result, over and over. I pulled my twin levels from my analog accessory kit and took care to bring my Linn back to a true horizontal plane. This is fairly simple to accomplish with slight left-to-right and front-to-back movements, as my LP12 rests atop an inner tube, MDF shelf and sandbag DIY isolation platform. Once the unit was leveled, I reapplied the KAB Grip and turned on the motor. Disappointingly, the bubble now swayed in and out of the center indicator ring with the rotation of the platter when it should have stayed seated central to the bullseye ring in the lens. I am sorry to have to report that this idea, though a splendid attempt at convenience, just doesnt work accurately enough to be counted on. The real advantage of this little clamp is found in what it brings to the table in terms of inner detail and resolution enhancement. Take the cut "Fair Game" from the 1977 self-titled Crosby, Stills & Nash [Atlantic SD 19104]. The numerous percussion instruments sprinkled throughout the foreground are slightly better focused, both in their physical space and resolution. On the title cut from John Klemmers Touch [Mobile Fidelity MFSL 1-006], the delicately recorded cymbals take on a bit more realistic sense of balance and decay and the room comes into slightly sharper focus. I say slightly here because the improvement wrought with the KAB Grip, while noticeable, is quite meager. This was a bit of a disappointment. While I find the Record Grip to be better than no clamp at all, I will leave it to you to determine whether it is justified for your own use. I would be remiss if I didnt point out that you will have a hard time finding any other new clamp out there for less than a couple hundred bucks, putting the KAB Record Grip in a class by itself. For years I have used a cheap patch cord cut up to reverse the leads in only one of the two channels, to verify my tonearm azimuth and close in on final VTA adjustment. The term azimuth describes the relationship of the stylus as it tracks the groove and should be perfectly perpendicular to the plane of both groove walls to provide proper left-to-right separation. If your stylus tracks the record slightly out of perpendicular, say at 89 degrees/91 degrees, you will have a slight channel-to-channel imbalance, not to mention the excessive wear and damage you will be doing to the groove walls. You can also use this device to help tune VTA (vertical tracking angle). VTA, also known as stylus rake angle, refers to the front-to-back aspect at which the needle traces the record. 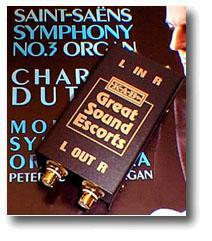 The Great Sound Escorts Stereo Canceler uses a special audio transformer to sum the two channels out of phase, leaving only the difference between the left and right and the vertical movement of the stylus. The $75 Stereo Canceler hooks up quite easily, but requires another set of patch cords. Since the Stereo Canceler is only connected for set up and not during actual playback, you wont have to worry about spending a fortune on this second set. You will also need a mono recording. Out came Respighis Ancient Dances and Airs For Lute [Mercury MG 50199]. With the device inserted in my phono chain, I dropped the stylus and turned up the volume. Hummmmm. What the heck? There was full-frequency music and the loudest 60Hz hum that I've heard on my system since the last time I played a test tone. Touching the case while touching a good ground proved to lower the hum but did nothing for the music; it was still there loud and clear. After a few moments of scratching my chin, it dawned on me to try the dingus in the OTHER direction, with the input for the output, and vice versa. Well, that did it. It seems that the cover had merely been installed backwards, with the in label at the output and the out label at the input. Well, that was easy enough to fix. With just moments of play, now with it correctly oriented, I found that I already had my stylus set pretty near optimally. Left-to-right balance was dead nuts, and the VTA was so close that it could be argued that it was only personal preference as to which setting sounded better with music. Adjusting VTA brought only slightly quieter output - and with only three-quarters of a turn of the adjusting tool that takes twelve and a half turns to move one-quarter inch. With the controls set for normal playback volume and the Sound Canceler in the chain, there was virtually no sound generated, near dead silence with only a whisper of strings and pipes. As I am using an older unipivot tonearm, I could very easily verify my settings by lightly rocking the arm left to right. This gave me the accompanied sounds of the music getting louder, softer then louder again, as the arm moved through right bias, perfectly vertical, into left bias and cycling back again. Until now, Ive felt it best for vinyl newbies to leave critical adjusting of these settings to an old analog dog like myself. This still may be good advice. But with this tool, what used to take even a very highly trained ear some considerable length of time to dial in can be achieved by most anyone who understands the objective in about five minutes -- assuming such ease of adjustment is provided by the tonearm in question. This is one of the most time-saving analog devices Ive run into in many a year, making this tool a hands-down winner. Last up is the highly effective and drop-dead-simple-to-use SpeedStobe, which sells for $89.95. 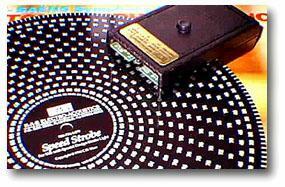 Speed inaccuracy is one of the most audible corrupters of your turntables performance. A speed variation of just six percent can alter pitch by a full sharp or flat, and the effect is broad-band, changing every frequency reproduced. The broadcast industry has set a standard of 0.3% variation as its tolerance. The KAB SpeedStrobe boasts accuracy within 0.03% -- not too shabby. The whole thing is comprised of just two parts, a 10" round "record" marked with numerous rings of rotational speed numbers and a quartz-locked, 9-volt-battery-powered, hand-held strobe. 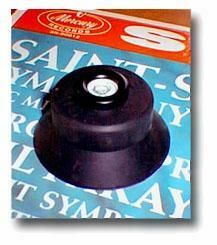 Just place the numeric "record" on your platter, turn the table on and aim the strobe in its general direction. If the number corresponding to your desired rotation speed, in this case 33 for standard 12" LP records, seems to be frozen in place on the "record," your speed is dead on. If it slowly wanders forward or backward, it is going too fast or too slow and requires adjustment. How much simpler could it get? This is the fastest-to-implement, easiest-to-use speed-measuring tool Ive ever used -- and yet another winner. Vinyl lovers of the world, KAB Electro Acoustics has hit a solid double and two home runs with these three new products. Though the USA Record Grip is far from the best clamp Ive run into, it certainly is not expensive. What it brings to your vinyl playback system should be judged accordingly. As I mentioned, I have been unable to locate a clamp available on todays new market that sells for much less than $200. However, the Stereo Canceler and SpeedStrobe are two of the finest, most useful tools you can add to your analog toolbox. Both are highly recommended.